NEW YORK (Forex News Now) – The U.S. dollar slid broadly on Friday, in the wake of a disappointing GDP report which showed that the world’s largest economy is slowing. In New York afternoon currency trading, the dollar fell against the yen and pound, with USD/JPY trading at 86.42, down 0.43 percent, and GBP/USD trading at 1.5692, up 0.52 percent. The Commerce Department reported earlier that U.S. gross domestic product, the broadest measure of economic activity, expanded at an annual rate of 2.4 percent in the second quarter, after expanding a revised 3.7 percent in the previous three months. The U.S. dollar also slid against the Aussie, kiwi and loonie: AUD/USD traded at 0.9037, up 0.37 percent; NZD/USD traded at 0.7246, up 0.09 percent; and USD/CAD traded at 1.0294, down 0.71 percent. But the U.S. dollar rose against the euro and Swiss franc, with EUR/USD trading at 1.3046, down 0.24 percent, and USD/CHF trading at 1.0412, up 0.01 percent. The euro’s losses came following weak data on German retail sales, which fell unexpectedly in June, and on consumer price inflation in the euro zone. 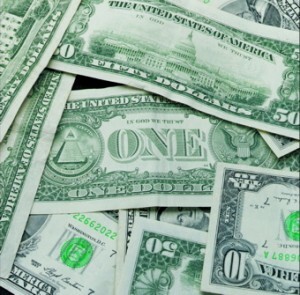 The U.S. Dollar Index, a six-currency gauge of the greenback’s strength, was down 0.12 percent.